Solar power is an excellent way to harness the sun’s energy to charge your devices. 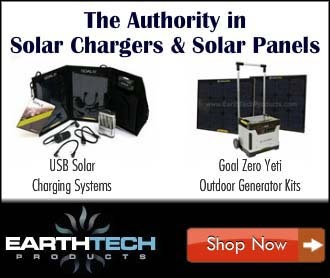 If you like to listen to music when hiking, camping or being outdoors, then having a solar-powered speaker is a must. A solar-powered speaker does just what it says, it charges the speaker using the sun and stores the energy in a battery hidden within the speaker. There is no need to plug the speaker into a power wall socket. It is basically a self-generating power source. These speakers also allow you to charge your phone. You can connect just about any device to one of these solar powered speakers. Enjoy listening to music or a podcast on your phone, tablet or music device of choice. The Eton Rukus solar-powered speaker is a rugged and water-resistant speaker great for any outdoor location. This solar-powered speaker will fully charge in direct sunlight in about 5 hours. It provides 8 hours of continuous playback. You can also charge the speaker in a wall socket using a Micro-USB cable. This solar speaker is about the size of a small book. It is convenient to carry or clip on your backpack. The Eton Rukus speaker can be connected wirelessly through Bluetooth or a mini cable. The Reveal Bamboo solar-powered speaker is a sleek and stylish speaker. The speaker is made mostly of Bamboo so it is Eco-friendly. It offers 8 hours of playtime with one full solar charge. This speaker will also charge your phone through a USB plug. It will play back audio using Bluetooth or a headphone mini jack. The sound quality is excellent with no distortion. The Reveal Bamboo solar-powered speaker is an excellent basic speaker to take to the beach or outdoor event. The Ecoxgear Sol Jam solar-powered speaker is fully water proof-great for the pool, river, beach or rainy day. The Ecogear Sol Jam speaker is fully submersible and can also float in calm water. It offers up to 15 hours of playback time. This solar speaker has a 1.5-watt solar panel and can charge it’s lithium battery in about 3 hours. It also has a LED meter to indicate the optimal angle for the sun. This speaker has great sound using two 5 watt speakers. It comes with a mini-jack for external sources and is Bluetooth compatible. The Sol Jam can work as a power bank to charge a phone or USB device. The Dreamix Playtime IP65 is another great choice for a solar-powered speaker. This solar-powered speaker allows for 30 hours of playback after being fully charged through a wall jack and can provide solar power up to 1/2 hour. It has a large lithium battery which is able to store lots of solar energy. The Dreamix Playtime has a smart battery management system that helps to reduce battery consumption. It is fully Bluetooth compatible and has a mini jack to plug in any device. This speaker is slash proof and has a protective rubber cover to ensure no damage when dropped. This speak puts out some serious sound and great low-end bass. Solar powered speakers are a convenient way to play music by using the sun’s energy. They require no outside power. They are small and easy to carry or pack away. It’s a great way to take your entire music collection with you into the outdoors. Solar speakers are great for hiking, camping, the beach or even lounging poolside.